According to a recent report by NOAA, the past 12 month period of July 2011 to June 2012 was the hottest ever recorded in the US since temperature records began in 1880. This period was also one of the driest on record with drought conditions currently reported over 56% of the US and still intensifying in many regions. The period of intense US heat came at the end of an extended La Nina which is known for causing hot, dry periods in the US. However, climate scientists are now noting that both the heat and extreme temperatures are being intensified by global warming. This is a departure from past statements from the scientific community which was previously reluctant to link single events to global warming. The fact that many scientists are now linking the current heatwave to global warming is a shift that was likely spurred by the obvious intensity of the recent heatwave and associated extreme weather. A summary of research papers investigating weather disasters caused by global warming was reviewed on NPR and provides a good example of how global warming helped fuel devastating weather events in 2011. And as time goes by, it will likely grow even more clear that global warming is having a greater and greater impact on weather around the globe. 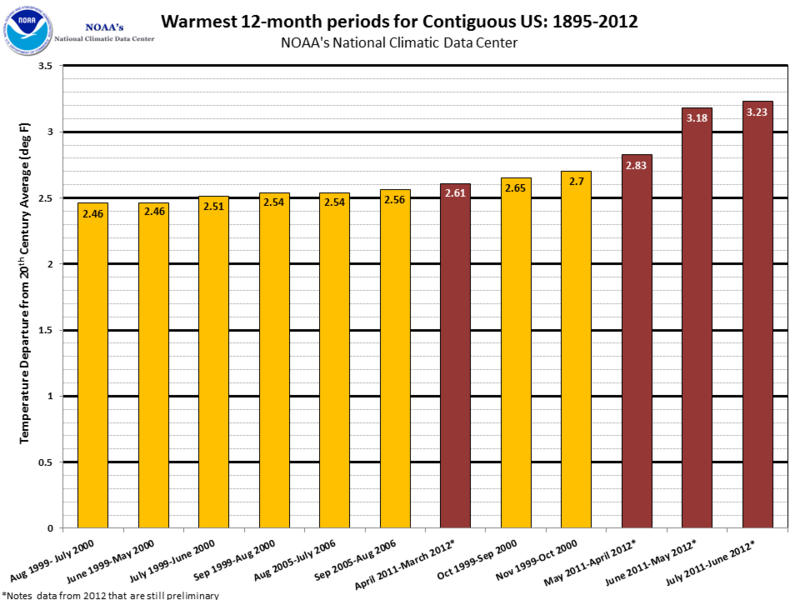 In total, the most recent 12 month record period was a full 2 degrees hotter than the climatological average. This hot period is at the end of a long trend of hotter temperatures for the US, the top ten of which have all occurred since 1999. The chart below, provided by NOAA, shows this obvious and upward trend.